It should strike you as no surprise that our teeth are incredibly important. You need a healthy, strong set of teeth to eat food. You need them to properly pronounce our words. When you flash a smile, your teeth are what others are naturally gravitated toward. No matter how you look at it, your pearly whites are paramount to a healthy, long-lasting, and fulfilling life. Unfortunately, not everyone has exemplary oral health. Quite the opposite, millions of Americans suffer from tooth loss, tooth decay, periodontal diseases, and other teeth-based issues as a result of an injury or natural aging. For many years, the only realistic and available treatments for those with missing teeth were bridges and dentures. Advances In Dental Technology — Now There’s A Solution For You! If you’ve been living with crooked, gaping, or profoundly shifting teeth inside of your mouth, take comfort in the fact that you no longer have to live like this. Over the past several years, great strides in the way of dental technology have allowed certified prosthodontists like Dr. Thames to perform extensive, safe, and effective rehabilitation to the mouth. The solution: cosmetic dental implants. What Are Cosmetic Dental Implants? Essentially, dental implants are a replacement for your tooth roots. By providing a strong and solid foundation for permanent (fixed) or replacement (removable) teeth, you’ll enjoy a beautiful, confident smile once again without the potential for your teeth to become misaligned once again. Don’t let the word “cosmetic” fool you — the idea behind dental implants is not only to restore your looks and confidence, but also to provide the functionality that a healthy set of human teeth are designed to have. This means that you’ll have no issues with speech, chewing food, or using your teeth for any other normal, day to day purposes. Are Cosmetic Dental Implants Safe? Yes. Though success rates vary on a number of factors such as age, the extent of prior maxillofacial or oral surgery, past injuries (if applicable), and where the implants are placed within the jaw, WebMD states that “dental implants have a success rate of up to 98%.” That’s a remarkably high success rate that’s safeguarded by the fact that you’ll be working with Dr. Thames and our state-of-the-art technology. With proper care not unlike taking care of a regular set of teeth, dental implants are designed to last a lifetime. Whether someone is looking at your smile from up close or far away, they’ll never be able to tell that your smile isn’t 100 percent natural. 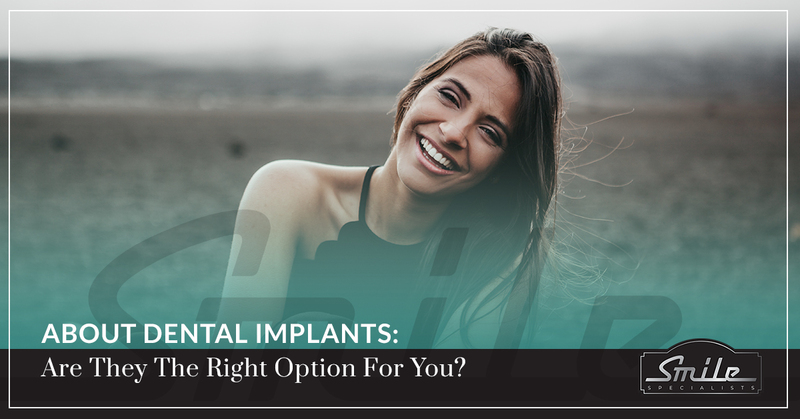 That’s because implants look and feel like your own natural set of teeth, as they are designed to progressively fuse with your jaw bone. Dentures, compared to implants, can be problematic in the sense that your teeth can slip around in your mouth, causing issues with speech and pronunciation. Because fixed implants are exactly that — fixed — you’ll never have any problems with orating. Now, you’ll no longer mumble or slur your words. If your vocation requires you to do a lot of talking, fixed implants are an incredibly valuable investment in your career. Anyone who’s experienced any tooth pain, or tried to eat food with a loose tooth, knows that it takes away from the enjoyment of the experience and makes it rather painful. Non-fixed dentures can slide around when you’re chewing your food, but with implants, you can once again eat normally without the fear or discomfort or shifting teeth. At the very least, isn’t that what you deserve? We’re not one to pass judgement on dentures (we offer dentures as a service that would be hypocritical of us), but the undeniable truth is that many people automatically associate dentures with elderly people. We’ve seen cartoons and movies of older people removing their entire set of teeth and placing them in a glass of a water overnight. While that’s not necessarily an accurate portrayal of what owning dentures is really like, there’s no stigma against dentures because they look no different than a completely natural, healthy, and strong set of teeth. Generally, patients report a certain amount of discomfort with removable dentures, as they are not actually fused or joined with your their jaw bone. This is almost never the case with permanent implants. If you’ve been struggling with missing or weak teeth that cause you daily issues with normal teeth functionality, our cosmetic dental implant services may be a good option for you. While this blog post is merely intended to be a high-level informational resource for our readers and nothing more, Dr. Thames and the team at our Garden Ridge cosmetic dentistry office are happy to schedule an initial consultation with you to determine if you’re a good candidate for this procedure. If you have any questions, don’t hesitate to call us at 210-742-5767.